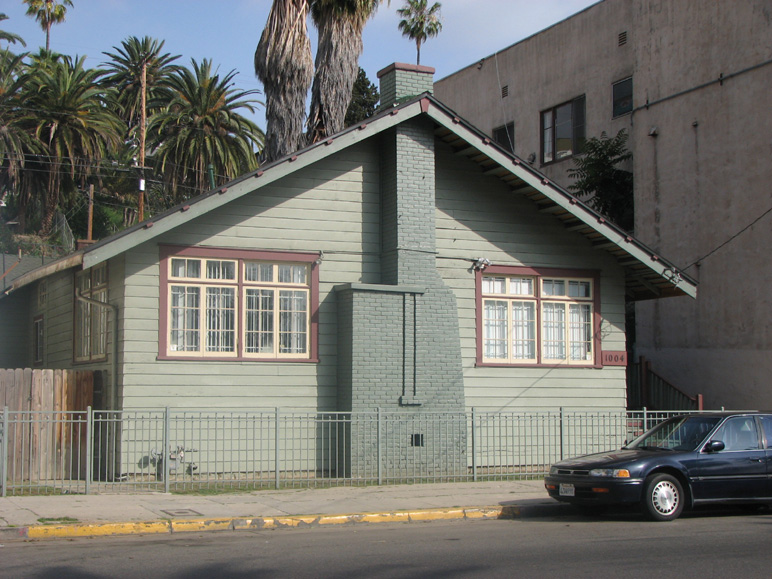 The original Echo Park Clubhouse, institutional building in the Craftsman style is the oldest existing Los Angeles Recreation Department clubhouse in the City. It was built in 1908 and designed by the firm of Sumner P. Hunt and W. Wesley Eager. Silas Burns joined the firm during the construction of the building and may have had some input on the design as well. The Craftsman building proved too small by the 1920s and was replaced by the present building, which was designed by Allied Architects. The original building was sold to the Echo Park Mothers Club, which had used it for their meetings since 1912. They moved it to its current location on a donated lot in 1925. It later became the meeting location for the Echo Park Women’s Club and later the Northeast LA Lions Club. It was subsequently owned and used as offices by The International Foursquare Church (Angelus Temple) and the Episcopal Church, which is the current owner. Other than the move and the loss of some downstairs area that it had in the park, the building remains essentially intact. The clear association with Echo Park as well as the subsequent association with other organizations makes it an important historical resource. It is also one of the earliest extant buildings that was specifically built for the City of Los Angeles, as well as the work of a master designer.